The Herb Chop Block features a solid wood chopping block and double-bladed knife. Both the board and knife handle are made of eco-friendly rubberwood that's as durable as it is beautiful. A concave surface on the board and contoured knife blades help to contain food for easier, more precise chopping. Heavy-duty magnets hold the knife securely in the side of block for safe and compact storage. 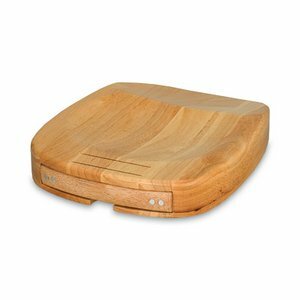 The Herb Chop Block also features a sloped front for easy transfer of chopped food and a recessed blade stand on the top of the block. Use it to chop fruits, vegetables, and herbs. Makes a great gift idea for those who love to prepare their own meals when they entertain!